Evocative ruins of a Tudor castle which suffered erosion by the sea and was abandoned. The grounds are now tended as a community garden. One of the three castles built on the orders of Henry VIII to guard the sea off Deal, the castle suffered sea damage in 1785, was remodelled in 1805 and garrisoned to assist in the defences against Napoleon before finally being demolished in 1863. What remains is incorporated into the sea defences built in the late 20th century. 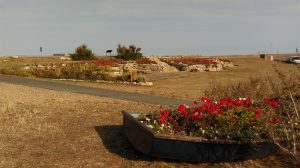 The area is now maintained by the Sandown Castle Community Garden Group, a group of local residents who want to retain the area as a pleasant place to linger.